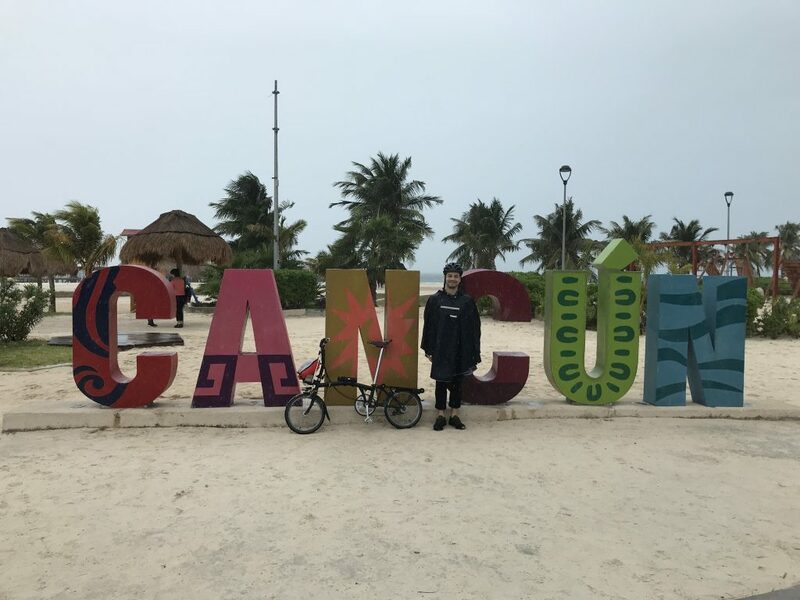 Before this trip, all I knew about Cancun is that it’s a popular resort destination. 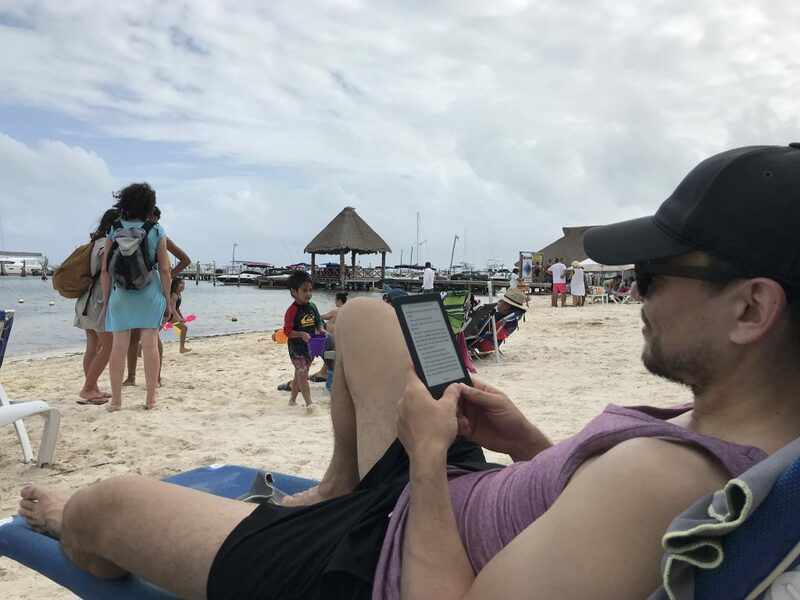 Since we were not going on an all-inclusive beach vacation, I needed to do some research. 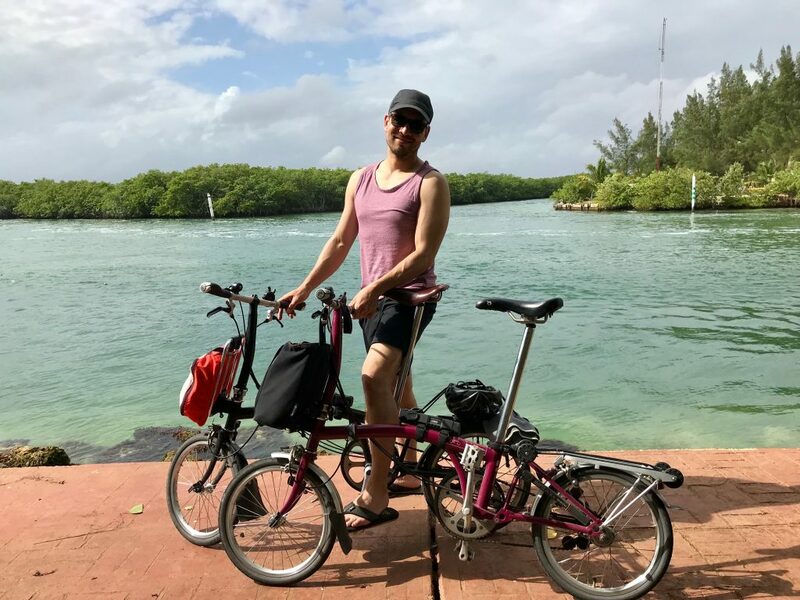 Where do two cycle tourists stay for a couple nights before heading inland? 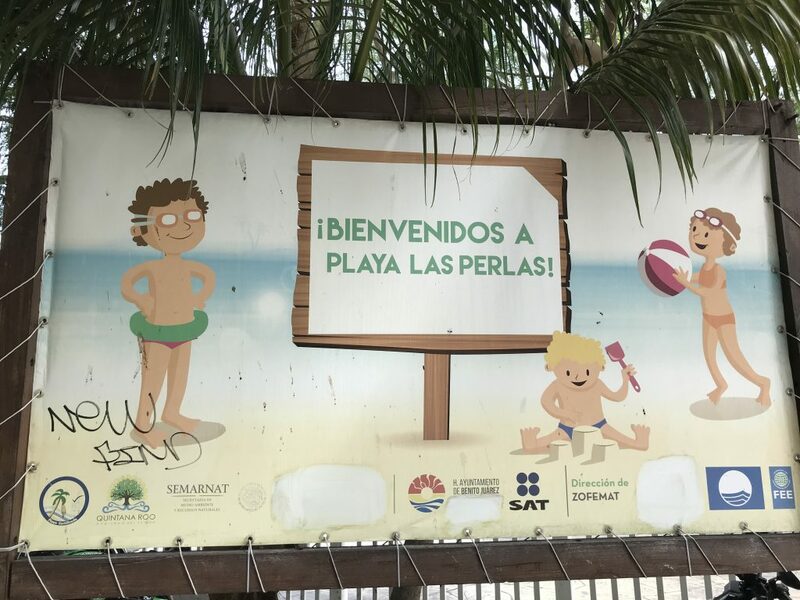 Can we get to a nice beach if we’re not staying on a resort? 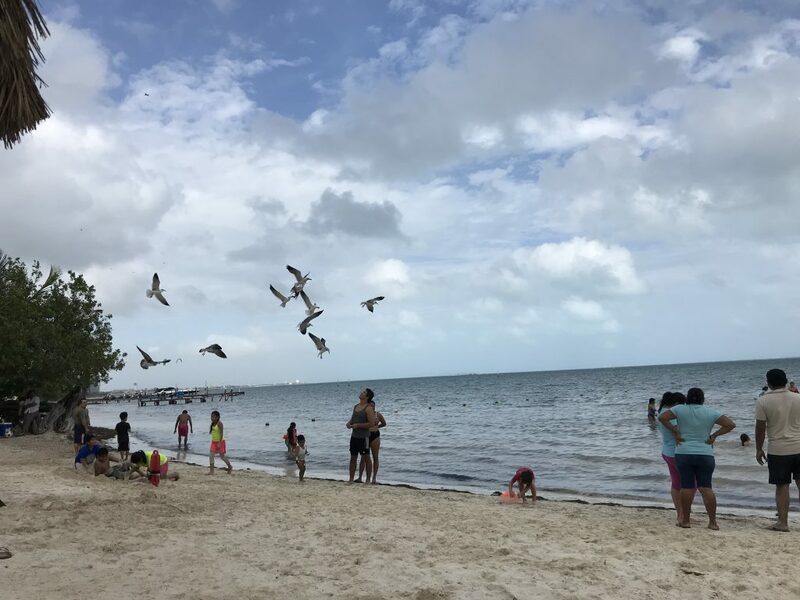 Besides beaches, what is there to see? 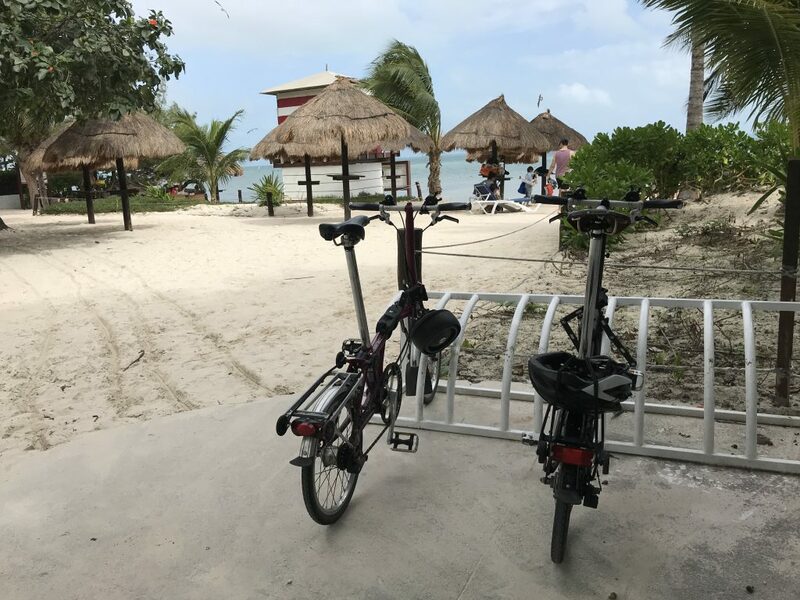 And most important— Is Cancun bike-friendly? 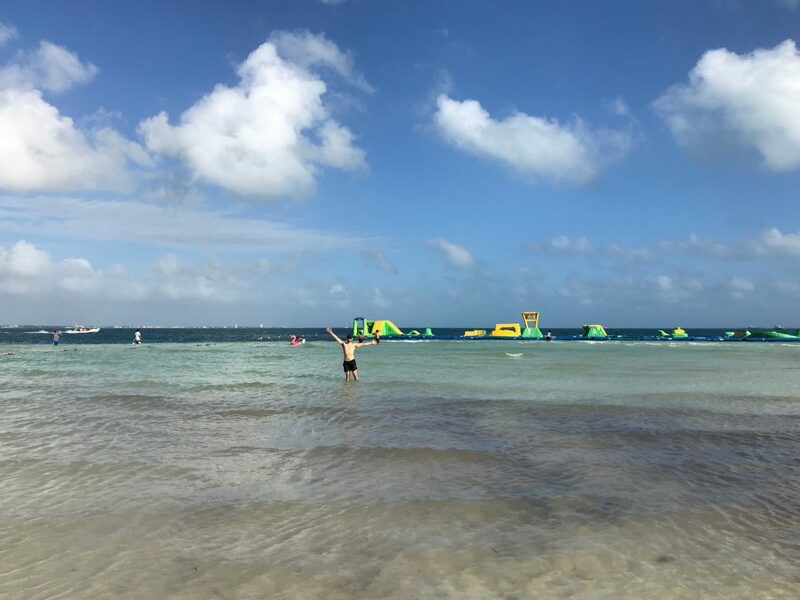 Cancun was a sleepy fishing village until the 1970s when Mexico decided to turn it into a resort town. 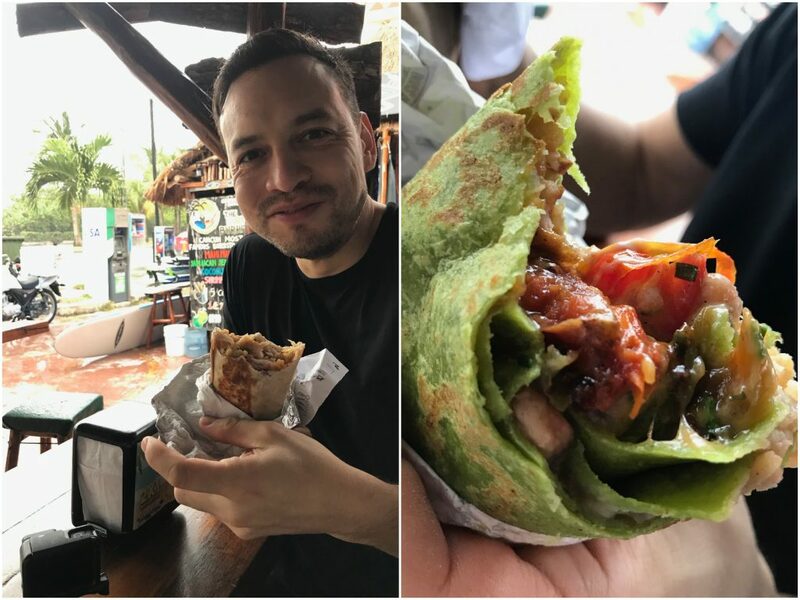 From a transportation perspective, the ‘70s were all about big cars and even bigger highways, and Cancun was clearly developed with this mindset. 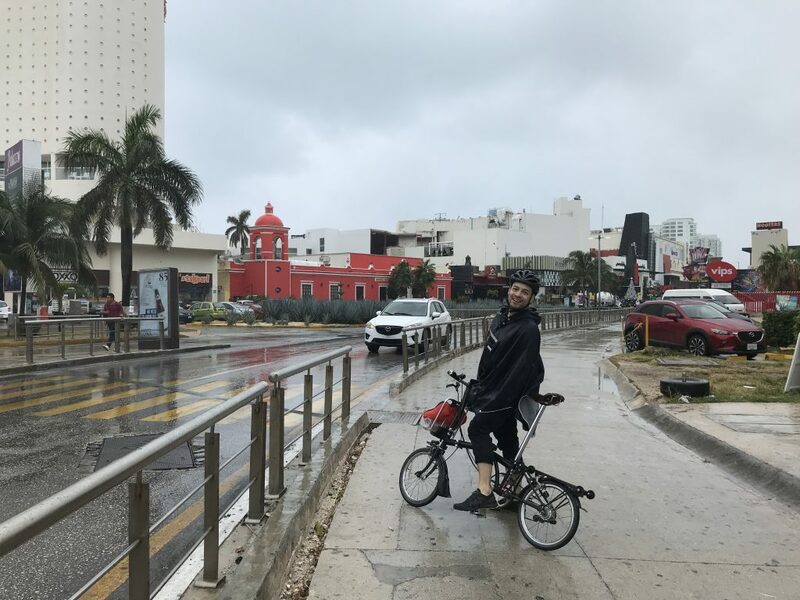 The main streets of downtown Cancun (the city proper, aka Cancun Cuidad) are full-on highways – four to six lanes wide of traffic that roars past at 80km/hr and rarely stops. Streetlights are few and far between. The intersections are these weird roundabouts with no pedestrian crossings. The sidewalks that do exist don’t connect and often just end at a curb alongside a highway-like street. How do pedestrians cross the road? They wait 5 minutes (literally, that’s how long it can be) for a break in traffic and then run across to the median and wait another 5 minutes to run across again. What passes for a crosswalk in Cancun – no lights, no speed bumps, just yellow lines across 6 lanes of traffic. But all is not lost. 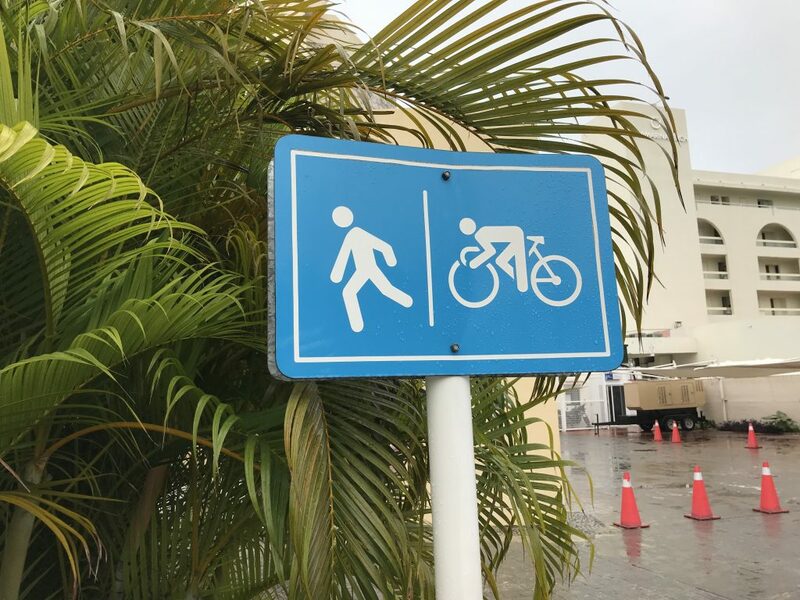 Cancun has some pedestrian and cycling infrastructure. Searching for more information about it online turned up nada, so I’m just going to have to take a guess — the bike paths we encountered all look pretty new, like they were built within the last decade. 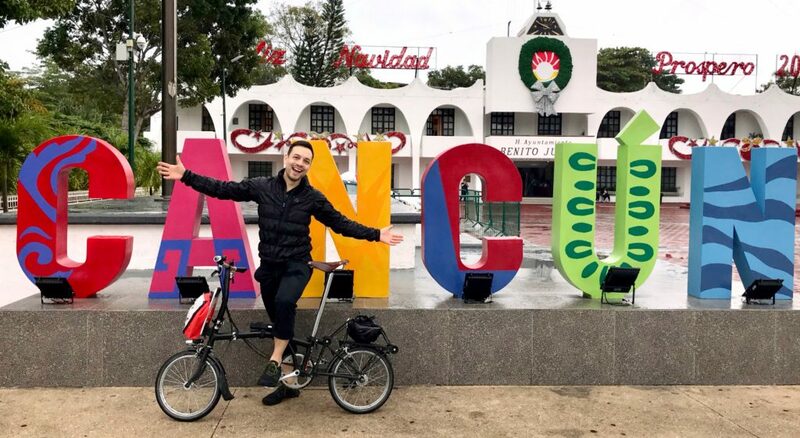 If anyone has more information about Cancun’s cycling infrastructure (past and future plans), please share! I’m curious. So where is this elusive cycling infrastructure? Not surprisingly, most of it heads to the beach. 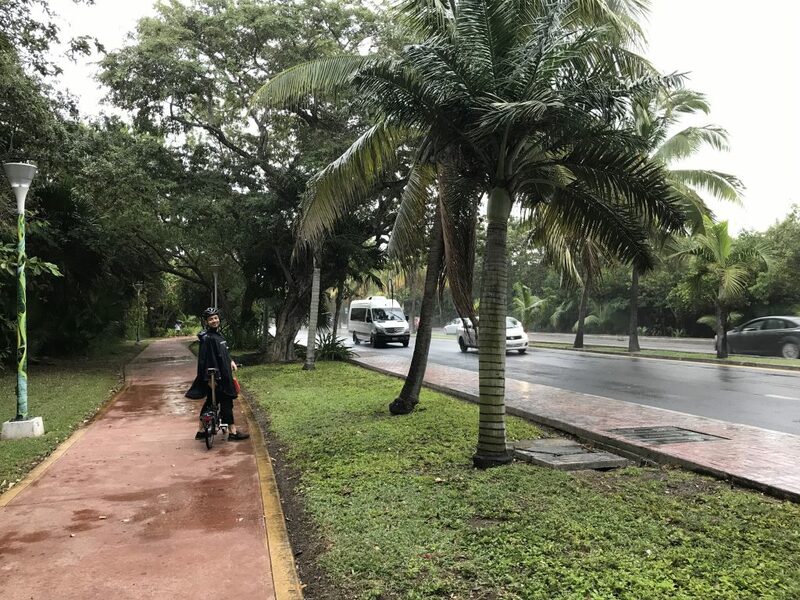 The cycle path on the north side of Blvd Kukulcan. 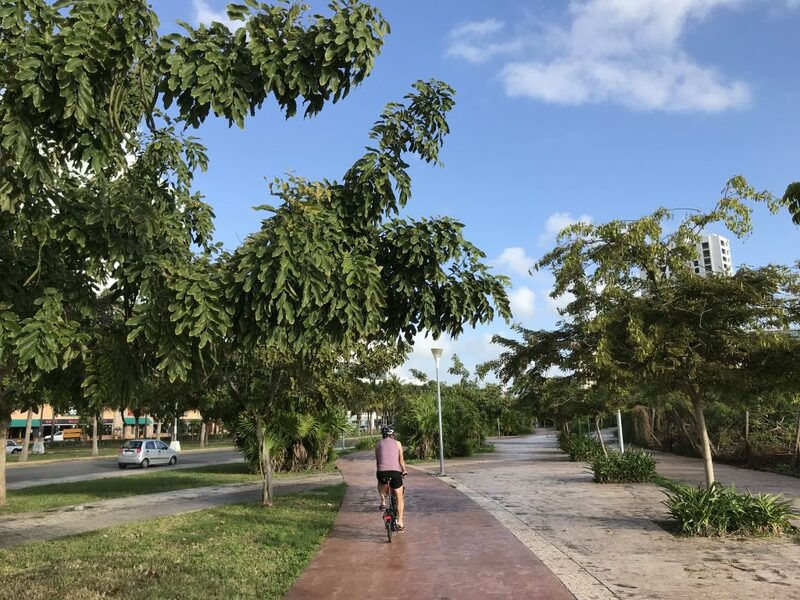 Blvd Kukulcan is the road that runs from downtown Cancun to the Zona Hotelera where most of the resorts and beaches are located. 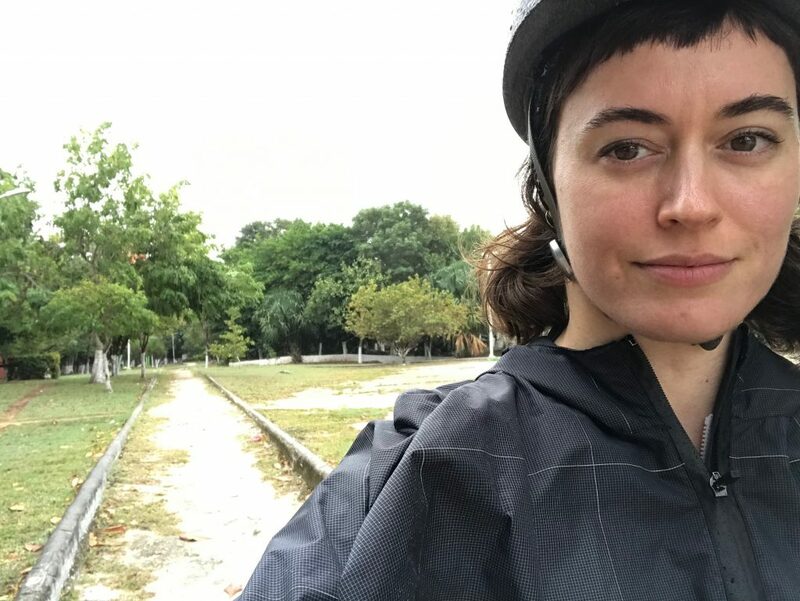 The other main road that has a bike path is Av Bonampak. This bike path is spotty and parts are still under construction. But let’s start with the route to the beach! 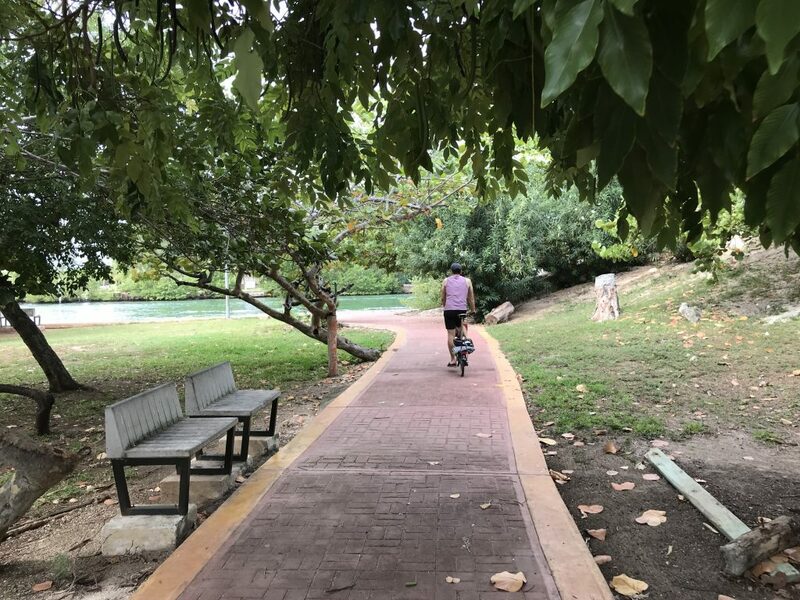 We were staying at the Agavero Hostel (there are many nice, affordable places to stay in downtown Cancun if you don’t want to stay on the resort strip) and the best route to the beach started from the dirt path in the park beside the hostel. Dirt park path. 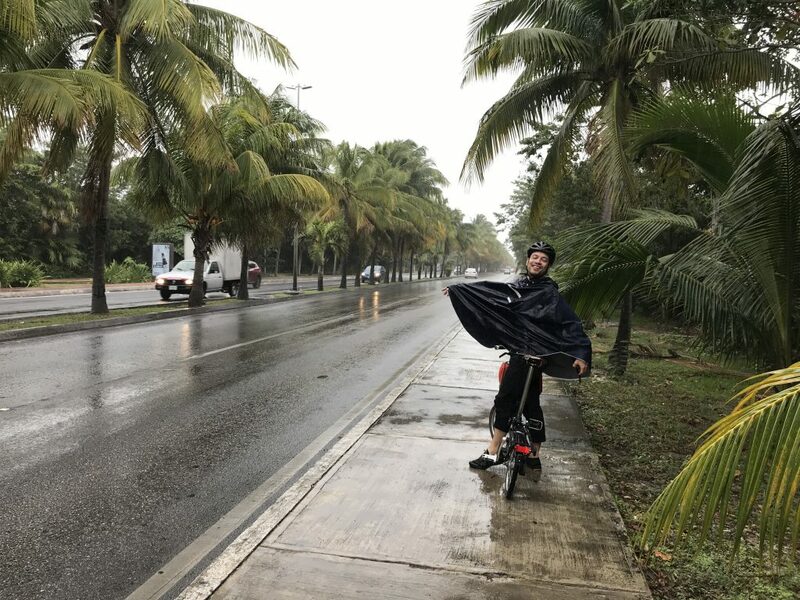 And yes, I’m wearing my rain cape because it rained on our first day in Cancun. That connected with a little side street that had an alley covered in graffiti. But then we were spit out into fast motor vehicle traffic on Av Xcaret which turns into Av Coba and finally Blvd Kukulcan. 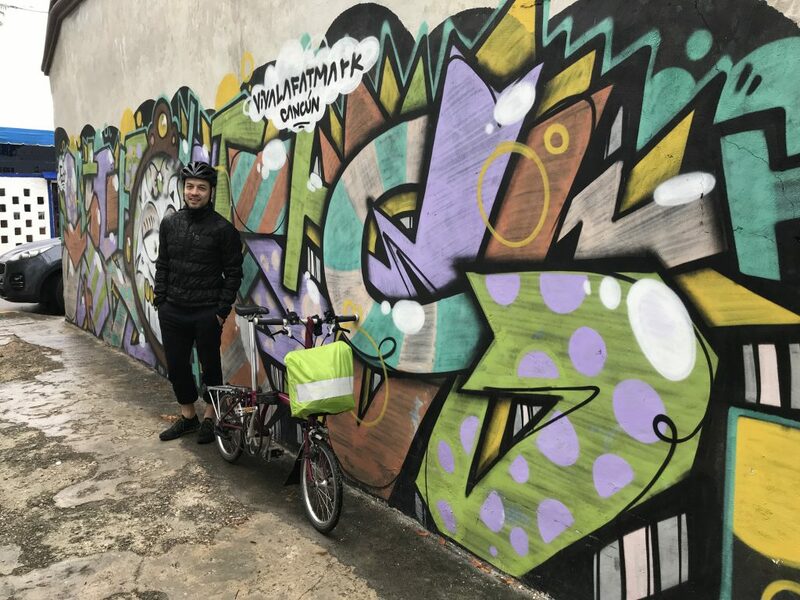 It’s not far, but it was a nail-biting few minutes of cycling amongst the metal wolves. In fact, on Blvd Kukulcan, we just got onto the sidewalk. 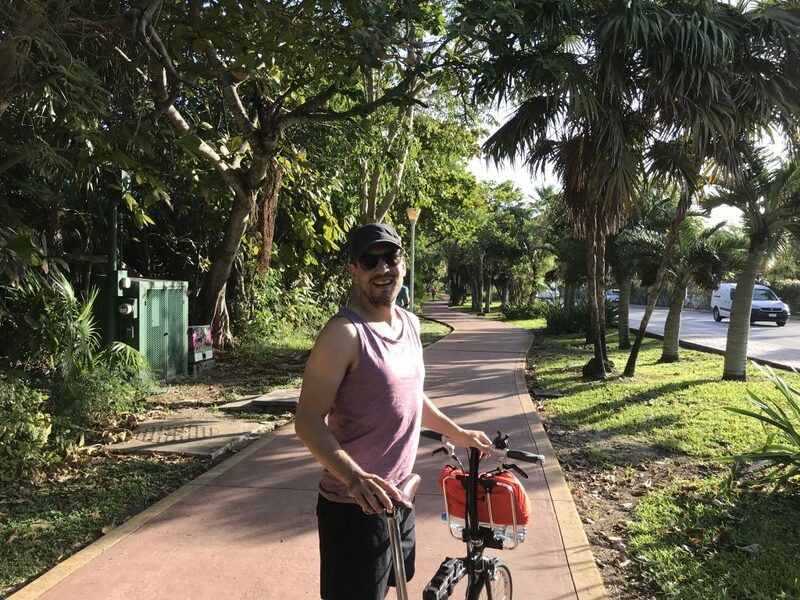 Sidewalk cycling for our own safety. 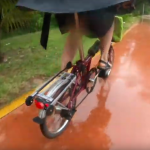 I knew there was supposed to be a bike path, and after squinting through the pouring rain, we realized we could see a red path on the other side of Blvd Kukulcan. Of course, there’s no where to cross safely, so we waited for a break in traffic and ran. Safely on the other side of Blvd Kukulcan on the bike path. 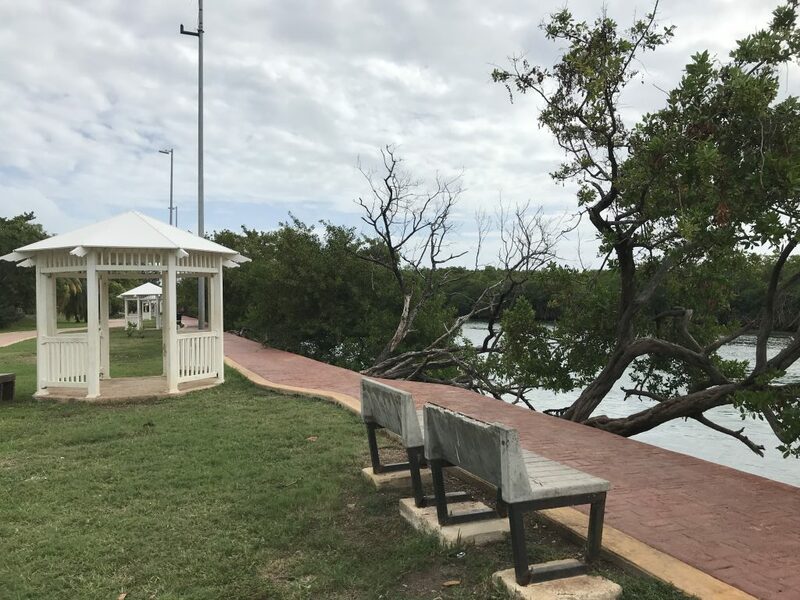 This path takes you right to one of the most popular public beaches on the Cancun strip, Playa Langosta. Where we took the obligatory photo with the Cancun sign. 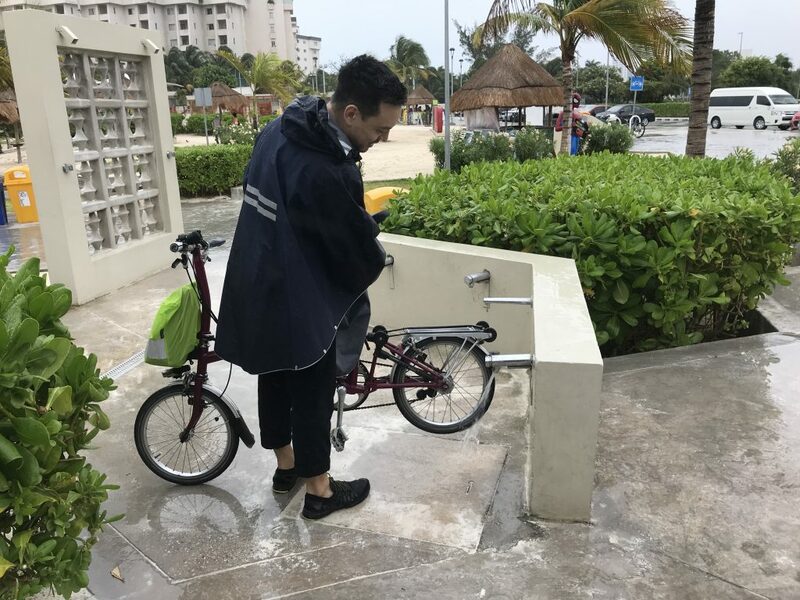 HANDY TIP: The foot showers beside the Playa Langosta bathrooms are an excellent place to wash the sand out of your brakes and bike chain. 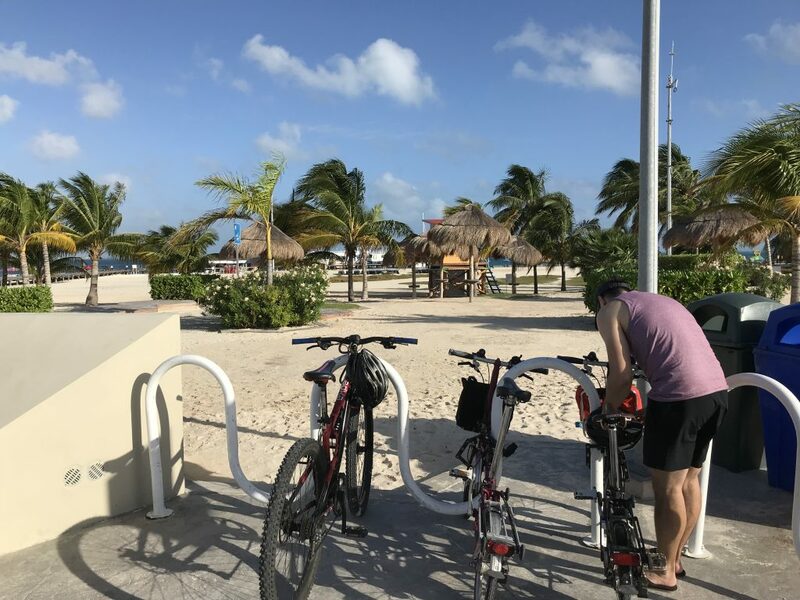 At Punta Cancun where Blvd Kukulcan turns south, the bike path just ends. 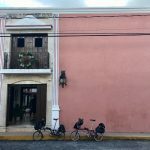 However, we wanted to go south to get to the El Rey ruins, so we had to run across the road again and pick up on the sidewalk. Where Blvd Kukulcan curves south. Soon afterwards, we saw the red of the bike/running path start again across the road, so we crossed over. On the way back we checked to see if there was a bike path crossing and we’d just missed it, but we hadn’t. It literally does not exist. The bike path just stops, and then starts again further down the road. 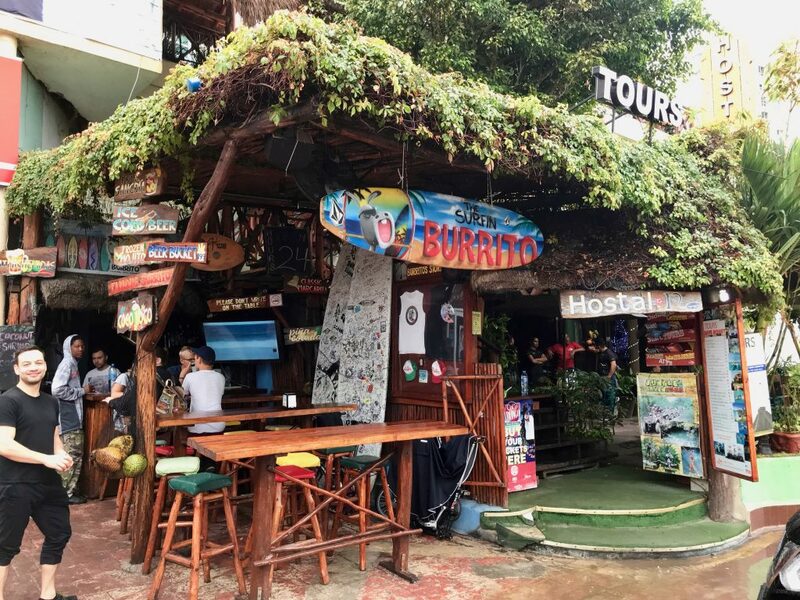 The path took us right to Surfin’ Burrito, where we got some lunch. But soon after Surfin’ Burrito, the bike path ended and we were back on the sidewalk. 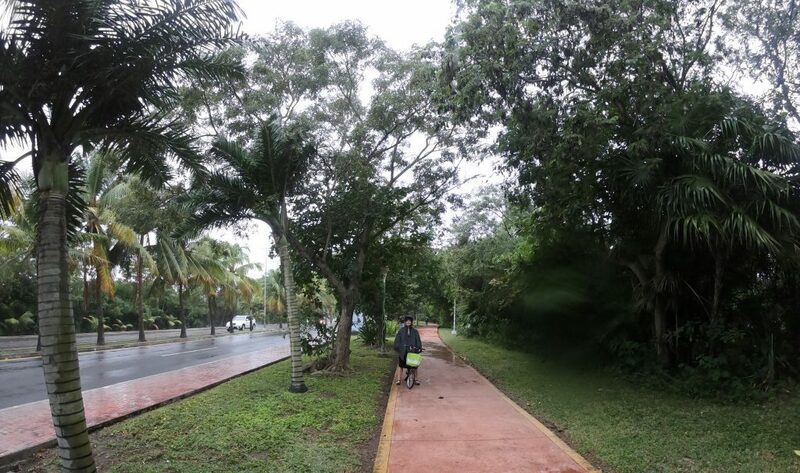 And when that sidewalk got too narrow, we crossed to the less busy sidewalk on the lagoon side of Blvd Kukulcan. 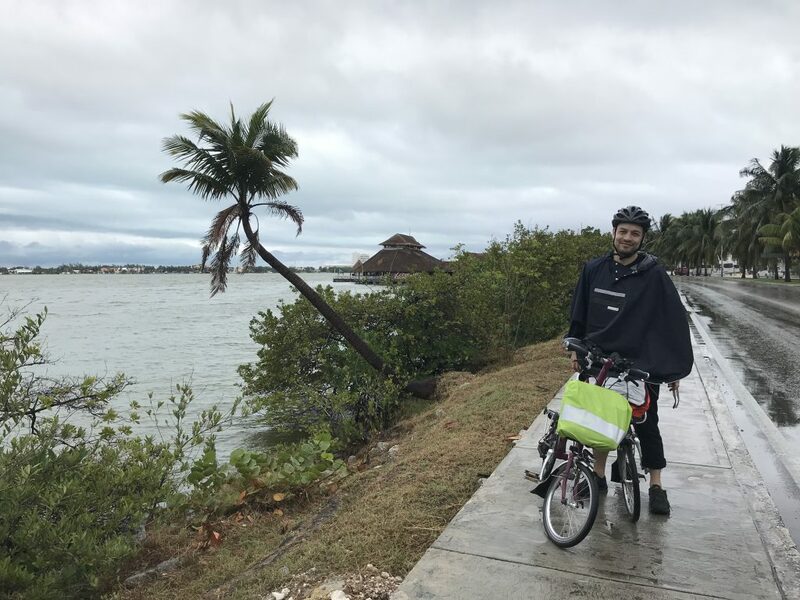 Cycling south with the lagoon. But the sidewalk randomly disappeared for things like parking spots and became unridably narrow in places. 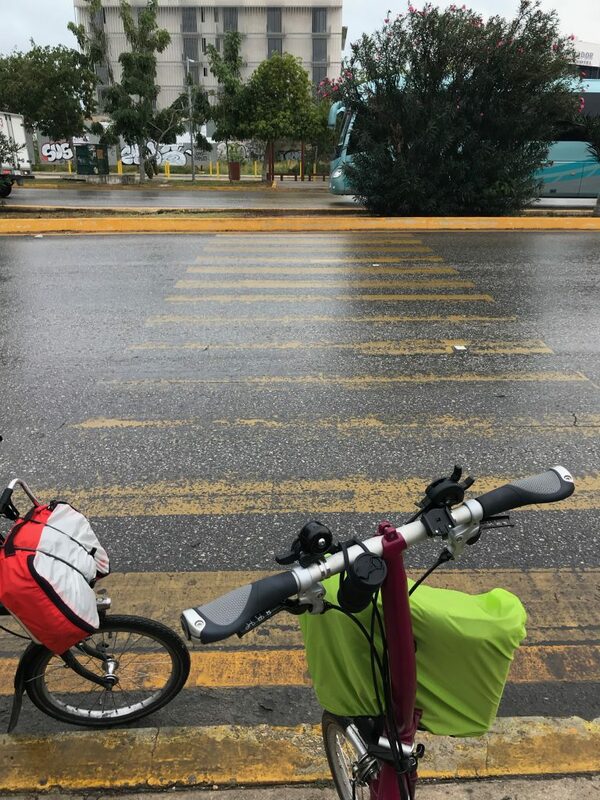 It was a frustrating ride, but the traffic (including lots of buses) on Blvd Kukulcan moves at 80km/hr and it did NOT feel safe cycling there. 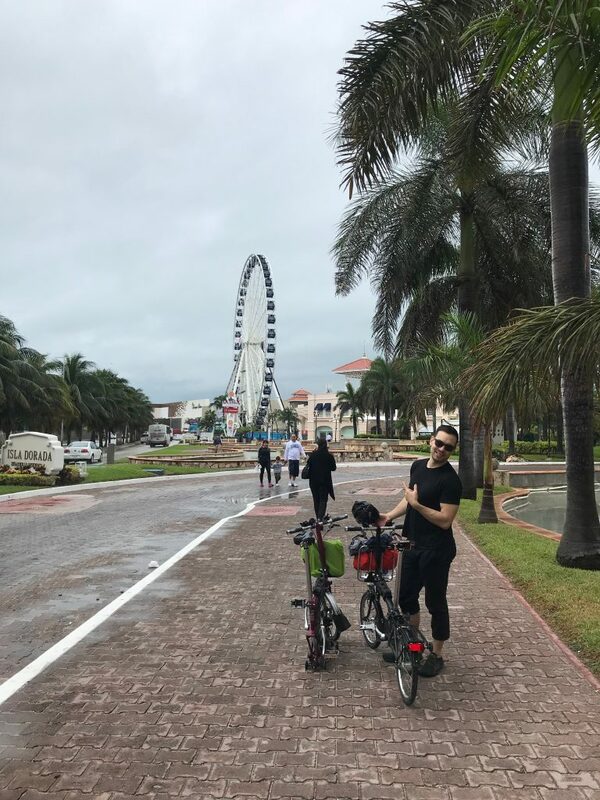 Once we got to the ferris wheel, we took it as a sign that we should give up trying to cycle this strip and turn back. I’m disappointed that we never made it to the El Rey ruins. How do people get there? I assume they take a bus or a taxi. That seems to be the only safe way to travel along Blvd Kukulcan. 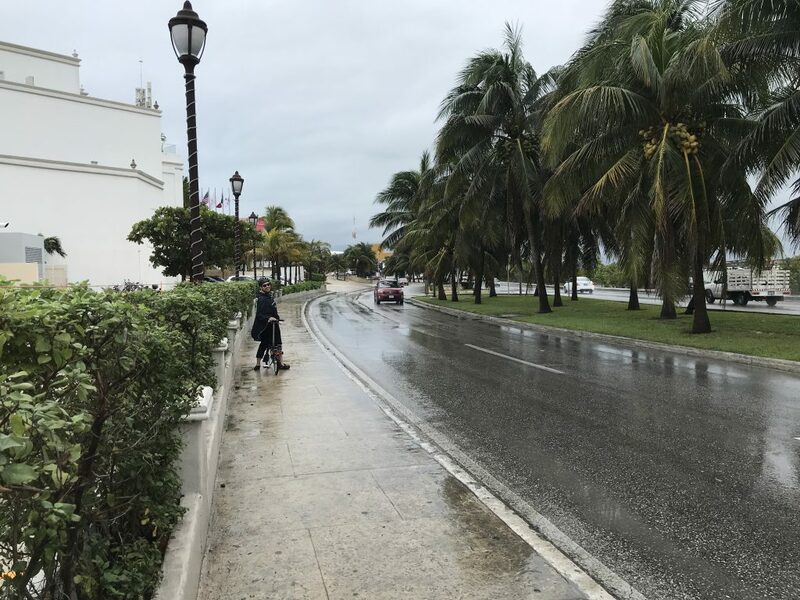 Bike path and super-wide sidewalk on Av Bonampak south of Av Sayil. Quiet street (Antonio Enriques Savignac) just south of Blvd Kukulcan. Cycle path on a sunny morning. 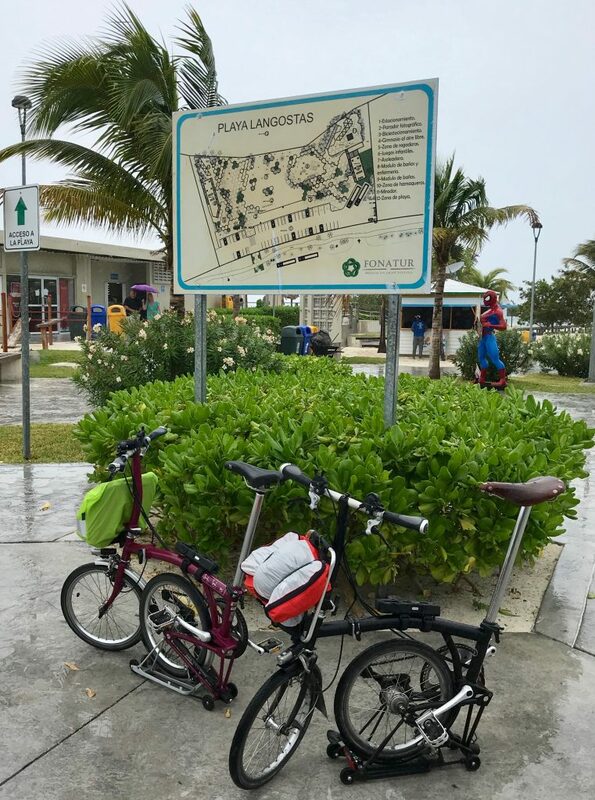 Bike parking at Playa Langosta! 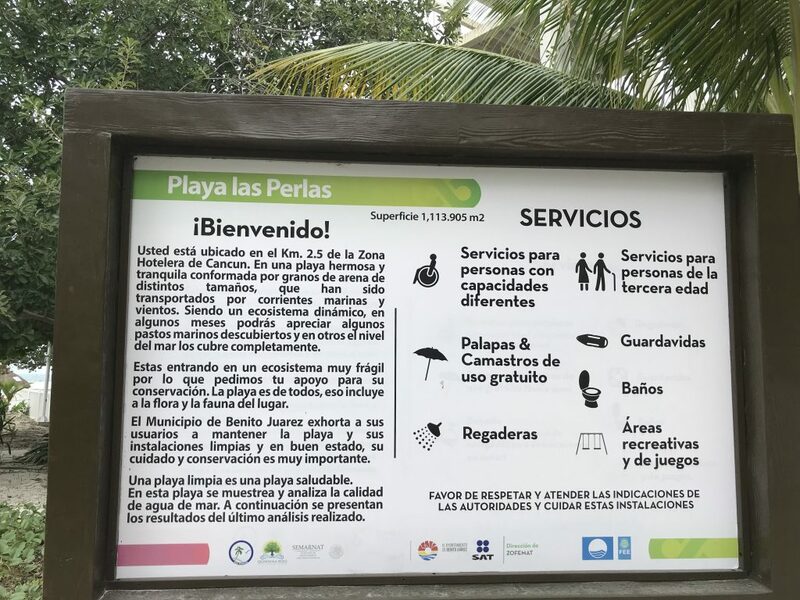 On the way back, across the road from Playa Langosta, we discovered the Jardin del Arte path. 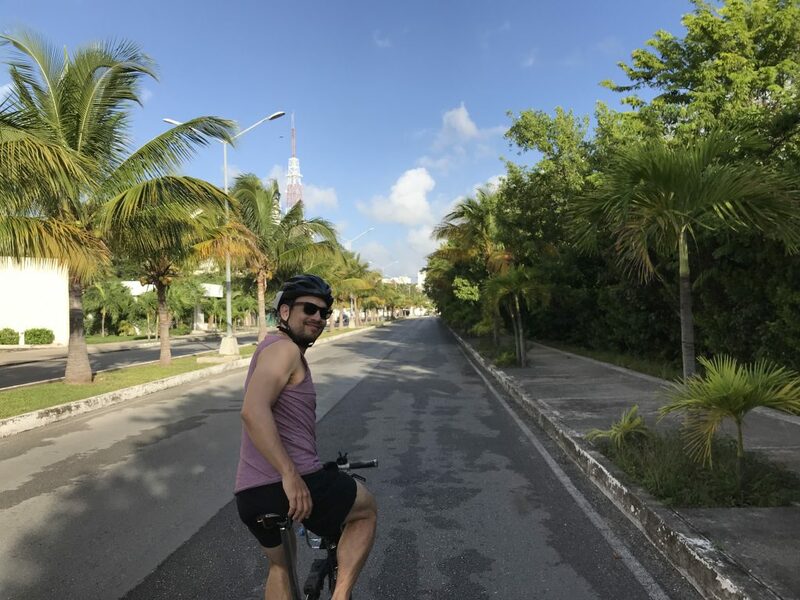 Overall, getting to the beach from downtown Cancun by bike is not the easiest thing to do, but it can be done.